B) Security deposit-one month tution fee (adjustable no refundable) at the time of leaving provided one month prior notice given before the next month`s fee is due. 2) All fee are due and payable in advanve on or before 10th of each month. Late fee of Rs. 20/- per day be charged there after. 3) A student who has used up his security in non-payment of fees as above will in order to attend any class, will first have to pay the fees as mentioned in Rule No. 1 above. 4) Once fee is paid cannot be refunded. 5) The management reserves full right to refuse admission without assigning any reason. 6) Students desiring of participating in public performance are requested to obtain prior written permission from the school. 7) Students are requested to participate when necessary, in the shows produced or sponsored by the school. 8) Notice of security fees adjustment must be given in writing before one month prior to leaving, failing which full fee will be charged for the following month after leaving. If any classes are attended in any month, full month`s fee would be charged. 9) Payment of fees will be accepted in cash or demand draft. 10) Please insist on official receipt at the time of payment. 11) The working hours of the school are between 10.00 AM to 1.00 PM and 2.00 PM to 7.00PM. 12) Details and timing of each class can be obtained from the office. 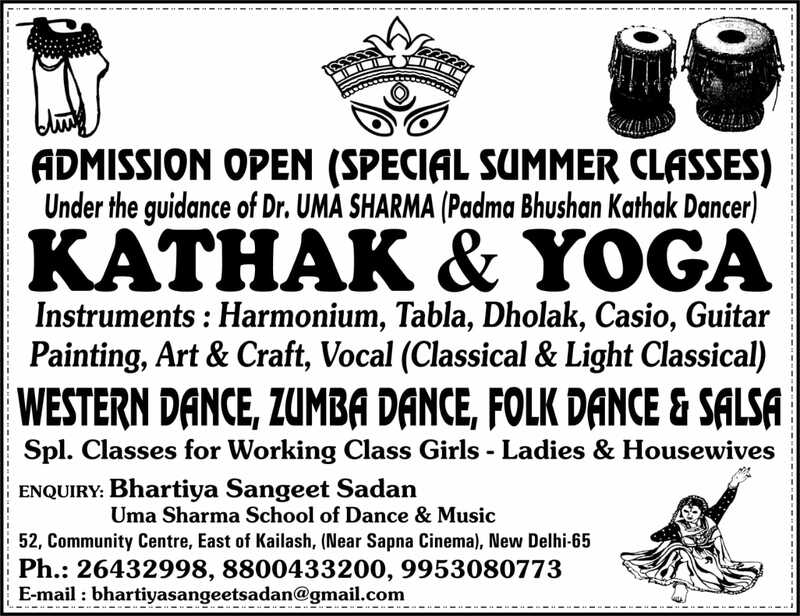 All the classes will be held thrice a week and duration of dance and music classes will be 45 minutes for children general classes and 60 minutes for adult classes. 13) Arrangements have been made to provided intruments such as Harmonium, Tabla. 14) Any change effected in the above regulation will be notified from time to time by general circular which will be placed on the notice board. 15) Since Bhartiya Sangeet Sadan is affiliated Prayag Sangeet Samiti, Allahabad, Students will be given certificates after appearing in exams and passing the same. After paying exam fee. kathak and vocal book is available on payment for theory exams. 16) For any further information, Please contact the office. 17) All students are required to come in white kurta pajama in dance class. 18) Ghungroos are available on payment.